Now run by the fourth generation of the Asher’s family, Asher’s Chocolates is the oldest confection company in the United States. In 1892, they opened their first shop in Philadelphia. Their small staff offered homemade goods and rare candies. Eventually their company outgrew its location and purchased 31 acres of farmland in Souderton, Pennsylvania and the former Goss Candies located in Lewistown, Pennsylvania. In March of 2011, Asher’s Chocolates announced that they are a landfill free company. Asher’s efforts to conserve natural resources has allowed them to generate enough renewable energy to power over 300,000 homes each day. Matt and I spent a lot of time browsing their website as we tried to decide which variety of chocolates to review. Our list of possibilities included chocolate covered pretzels, peanut butter and chocolate swirled seashells, and milk chocolate s’mores. We decided to try their Milk Chocolate Sea Salt Caramels. The vanilla caramel is dipped in milk chocolate and sprinkled with sea salt. This was the first time we tried a combination of salty and sweet candy. When you first take a bite, you taste the milk chocolate and then you get a mixture of salt and sweetness as you chew the caramel. The caramel and chocolate were rich and the salt added an extra mixture of taste. The presentation of the chocolates was nice. Our caramels arrived in a box with a see-through top. Despite the warm weather, their shipment arrived cold and in perfect condition. 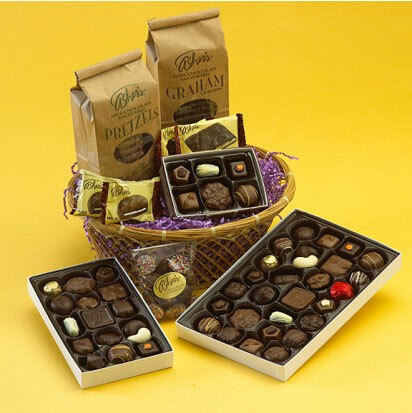 They also offer a variety of gift baskets and assorted boxes of chocolates. Many of the chocolates and candies are available as sugar-free options. 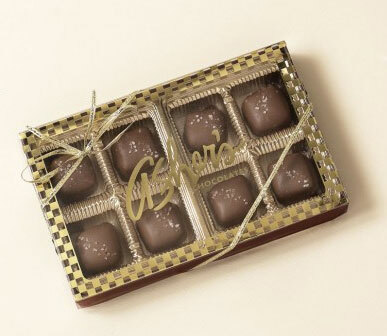 To learn more about Asher’s Chocolates, you can visit their website at www.ashers.com. If you are near Souderton, Pennsylvania, they offer tours of their chocolate factory. You can find several links on their Facebook page about the health benefits of chocolate. Readers of Our Virginia Home will have the opportunity to win a box of Sea Salt Chocolates. Enter by using the Rafflecopter form below. If you are new to entering giveaways, please see this Rafflecopter Tutorial. Giveaway will run from August 16th to 11:59PM EST on August 27th, 2012. Our Virginia Home received a product from Asher’s Chocolates for the purpose of a review. However, only our honest opinions were expressed. I want to try bot their Vanilla an Chocolate Fudges! Thanks for the giveaway! Sea salt caramel sounds awesome! Love all chocolates with peanut butter! The Sea Salt Caramels – milk chocolate sound AMAZING! Sea salt caramel is my FAVORITE candy!! I love Sea Salt Caramels. 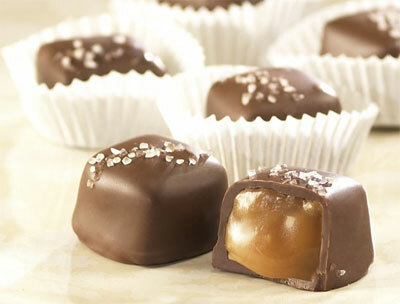 The Sea Salt Caramels —-chocolate yummm……..
Never tried chocolate salted caramel. Sounds delicious. Seriously, anything milk chocolate. Particularly if it has nuts, and slightly less if it is too chewy, but their smores chocolates look awesome, as do their peanut butter smoothie. Peanut Butter Sandwich looks good. That’s wild! You want me to pick one? I’d like to TRY them all! To keep the balance in line … I will choose the starfish first. Then the popsicle shape. YUM! I like the Milk Chocolate Smothered Potato Chips, 16 oz. the milk chocolate flip flop orange looks great! Milk Chocolate Smothered Potato Chips sound amazing…I’ve never had them, but love the idea of sweet and salty together! The chocolate fudge looks heavenly! The Almond Buttercrunch looks delicious. The dark chocolate smothered graham crackers look good! I would like to try the Milk Chocolate & Peanut Butter Pretzel. The Peanut Butter Sandwich sounds amazing! THe Almond Buttercrunch looks great! They all sound so good, but I think I would really like the Milk Chocolate Smothered Pretzels. The Peanut Butter Smoothies. Yum! I would love to try the Milk Chocolate Almond Bark. YUM. I like the Dark Chocolate Caramel-Marshmallow Square. The Almond Buttercrunch. I love chocolate and toffee. The milk chocolate and peanut butter covered pretzels! the milk chocolate s’mores sound amazing! My favorites are their Caramel-Filled Pretzels Smothered in Dark Chocolate! Besides the sea-salt caramels??? It all looks yummy, but a chocholate dipped potato chip…Yes please! So hard to pick one but I would choose Pecan Caramel Patties- MMMMM! I think my favorite would be the dark chocolate peanut butter cups. Peanut Butter Smoothie looks so YUMMY! They ALL look delicious….but as a diabetic, I’d have to go with ALL the sugar-free varieties! The Mints look yummy! The White Chocolate Peanut Butter Cup and the Milk Chocolate Mini Starfish both look amazing! Laura and Matt are from Charlottesville, VA. We write about products we love, our pets, and DIY projects. Use our referral link and shop at Boxed to get $15 off your first order. We use Ebates to get cash back on our purchases made online.